When AutoSave is not on and an Office app closes unexpectedly before you save your most recent changes, Document Recovery automatically opens the next time you open the Office app to help you get your file back. The safest way to work is to save to the cloud using OneDrive or SharePoint and turn on AutoSave.This feature is only available if you have an Office 365 subscription. If you are an Office 365 subscriber, make sure you have the latest version of Office. If you are not an Office 365 subscriber or for files stored locally on your computer, ensure that AutoRecover is turned on, and manually save (press Ctrl+S) your file frequently. How do I decide which files to save? 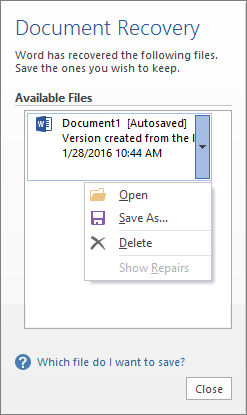 If you see multiple files in the Available Files list on the Document Recovery pane and you're not sure which ones to save, the date and creation time of any automatically saved document appears under the document name, which may give you a clue about which file you want to recover. If you see multiple versions of the same file, you'll probably want to open the one with the most recent time because it will have the most recent changes. You can also click each file to open the document and review it. After opening any file in the list, you can continue working in it, and you can close the Document Recovery pane when you have recovered all documents that you want to save. You can quickly delete unwanted files by clicking the arrow next to the file name, and then clicking Delete. If you click Close without reviewing all recovered files, you'll see an option to view them again later. The next time you open the application you'll have the option to save or remove those autorecover files. Yes, I want to view these files later (safest option) - Select this option if you are not sure whether you need the data in the recovered versions of the files. No, remove the files. I have saved the files I need- Select this option if you are sure you don't need the data in the recovered versions of the files.